Social justice advocate and anarchist Emma Goldman was known for her strong opinions, and her thoughts about the behavior of — and around — women on the ill-fated Titanic were intense as well, as seen in her commentary first published in the Denver Post back in 1912. Emma Goldman. Photo by the Gerhard Sisters and courtesy of the Emma Goldman Papers. The article headlined “Suffrage Dealt Blow by Women of Titanic” is one of the many fully annotated and set in historical and political context newspaper reports, articles, letters, surveillance and legal documents contained in the newest book from the University of California, Berkeley’s Emma Goldman Papers Project. “Light and Shadows 1910 – 1916” is the the third of the four-volume series, “Emma Goldman: A Documentary History of the American Years, 1890-1919.” It is due out this spring. The Emma Goldman Papers was established at UC Berkeley in 1980. Its editors have amassed 40,000 documents — a treasure trove of resonant history — published in microfilm and awaiting funds for digitization, three high school curricula, a traveling exhibition and an award-winning website. 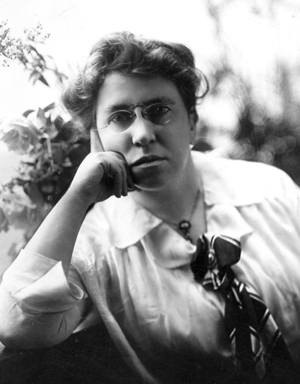 Emma Goldman Inquires to Know If Equality Is Demanded Only at Ballot Box — Human Nature Came Into Own in Men. Barring all sensational and conflicting reports of the Titanic horrors₁ there are two features which seem to have been overlooked altogether. One is, the part woman has played in the terrible disaster, which to say the least, is in keeping with centuries of her training as a mere female. With all the claims the present-day woman makes for her equality with man, her great intellectual and emancipatory achievements, she continues to be as weak and dependent, as ready to accept man’s tribute in time of safety and his sacrifice in time of danger, as if she were still in her baby age. “The men stood aside to let the ladies go first.” What about the ladies? What about their love superior to that of the men? What about their greater goodness? Their demand to equal rights and privileges? Is this to be found only at the polls, or on the statutes? I fear very much that the ladies who have so readily accepted the dictations of the men, who stood by when the men were beaten back from the life-boats, have demonstrated their utter unfitness and inferiority, not merely to the title of man’s equal, but to her traditionary fame of goodness, love and self-sacrifice. It is to be hoped that some there were among the steerage victims at least, who preferred death with those they loved to life at the expense of the loved ones. The second feature is this: To die for those we love is no small matter in a world where each is for himself and the devil take the hindmost. But to die for those far removed from us by a cold and cruel social and material gulf — for those who by their very position must needs be our enemies — for those who, a few moments before the disaster probably never gave a thought to the toilers and pariahs of the ship — is so wonderful a feat of human nature as to silence forever the ridiculous argument against the possibilities of human nature. The average philistine forever prates of how human nature must be coerced and beaten; how it must be kept in check and disciplined. How little he knows of the grandeur of human nature has never before been so magnificently demonstrated as by the crew of the Titanic, the sailors, stokers, workers, and drones belonging to the disinherited of the earth! With neither club or statute to compel them, I wonder what induced these men to go to their death with greater fortitude than do soldiers on the battlefield? Why, it is human nature, stripped of all social artifice, of the deadening and dulling chase for material gains. Human nature, come into its own! Into its deep social kinship which so far has only expressed itself in great stress but which points to still greater possibilities for the future, when man shall no longer his brother maim! 1. The White Star luxury liner Titanic struck an iceberg and sank on 14–15 April 1912, resulting in the loss of over 1,500 passengers. Although the survival statistics indicate that women were allowed into the lifeboats first, there is debate over whether it was the male passengers who allowed the women to go first or the crew who refused to allow men to enter the lifeboats. The discrepancy between first- and third-class passengers was evident in the survival statistics, suggesting that the wealthier passengers had been given preference in the limited assignment of lifeboats, although eyewitness accounts are rather unclear and contradictory on how this happened. Denver Post, 21 April 1912, p. 8.